Add Character To Your Web Site! 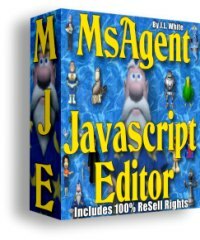 Many people are not even aware that MsAgent is included with the Windows?operating system. The default character of Merlin, is the only one included, but there are 100s more available for download. With MJE, webmasters can easily enhance their Web pages with interactive personalities in the form of animated characters. These characters can move freely around the computer display, speak aloud (and by displaying text onscreen), gesture, wink, wave and be animated in many other ways to help get your message out. SHOW: This will make your Agent appear on the screen. HIDE: This makes the Agent go away. MOVE: You can click on the Character and move him any where on the screen and click the Move button. You also can enter the X & Y coordinates. PLAY: Each Agent has its own set of animations it can play. Like doing Magic, or Announce, or Read, etc. SPEAK: Whatever you have in the text box above, will be spoken by your Agent. THINK: Whatever you have in the text box will appear in a balloon (like speak) but only words are shown. WHISPER: Same as Speak but in a muffled voice. SIZE: You can enter a certain size or percentage for both width and height of the character. TEST SCRIPT: Opens a browser so you can see what you script will look like. CLEAR SCRIPT: Removes all commands from the script below. CLIPBOARD: Same as Embed, but only copies the created routines to the clipboard, so you can manually place it where you want in your files. SAVE SCRIPT: Saves the current list of commands as a MJE script. WebMasters will be amazed at the response they will get from users! These characters can take an ordinary webpage and bring it to life with just a few simple lines. Show visitors what is important on your site. Direct them where to go to find additional information about a certain product or service. Greet them and ask them to sign up for your newsletter or download your latest software creation. Tell them What to buy and How to do it! The uses for MsAgent technology is endless.